At my dental practice, Armour Dentistry, in Newtown, PA, I seek the most conservative treatment plan to achieve the best results. In dentistry, “conservative” means the use of minimal dental interventions but can also refer to the treatment that conserves the most natural tooth structure in a long-term maintainable way. Conservative dentistry is not necessarily the fastest or simplest treatment. For example, when teeth are far out of alignment, orthodontic movement into proper position is the best way to achieve a healthy, cleansable and maintainable result. Once teeth are properly aligned, any elective cosmetic treatment can be more conservative with respect to removing minimal underlying tooth structure. When teeth are crooked and malaligned, not only are they difficult to clean, but cosmetic treatments typically require more aggressive tooth structure removal with a few exceptions like this case. After caring for this patient in Newtown, PA for a few years, she had a renewed trust in dentistry and demonstrated her continued commitment to oral health by sticking to regular cleanings and remarkably improving her home care. She underwent extensive treatment for back teeth but when she was done, still lamented that her crooked front teeth have bothered her for her whole life. We had discussed orthodontics for the past three years and even though she knew it was the best treatment option, it was not going to happen for her in the near future. We discussed a minimally invasive option – Composite Bonded Veneers – that can be adjusted in the future should she later undergo ideal orthodontic treatment. We used our newest bonding system designed especially for optimal front teeth esthetics. It utilizes layers of composite that are placed to mimic the layers of the natural tooth from more opaque dark interior to more translucent light exterior and can incorporate painted tints that resemble white or grey spots or cracks within teeth to give a natural look rather than the uniform one-shade bonding of the past. The desired shade/color is selected. Often patients choose to whiten teeth before undergoing treatment of front teeth. I will discuss tooth whitening in an upcoming post. The area of treatment is usually anesthetized with a topical anesthetic gel and then a local anesthetic using a special technique to reduce discomfort. The tooth surface is prepared which may involve roughening the surface lightly to recontouring the enamel surface depending on the position of the tooth and the desired amount of dental material thickness. The tooth is then treated with an acidic gel that microscopically etches the surface to allow for micro-porosities that improve the infiltration of an adhesive bonding agent. If the underlying tooth is dark or has discolorations, a block-out opaquing layer is placed. Composite is then layered and sculpted on top of the natural tooth and hardened with a blue-wavelength light. In addition to careful cosmetic polishing, the margins are contoured to allow for optimal gum health and cleansability. Who is a candidate for bonding? Patients in my Newtown, PA dental practice are often interested in improving their smile. Indications for composite bonded veneer treatment vary from covering up defects in teeth, intrinsic staining (internal stain like tetracycline stain or necrotic/dead tooth stain), minor changes in angulation and tooth shape or lightening teeth beyond what can be achieved by whitening. It can be used as a temporary veneer option for teens until they are done growing and can undergo more definitive porcelain veneer treatment. A personalized evaluation is required to determine candidacy for bonded veneers. It is very important to fully understand benefits and weaknesses of this material and alternative options before beginning treatment. Esthetics: Porcelain is superior to Composite but Composite is getting better and better. 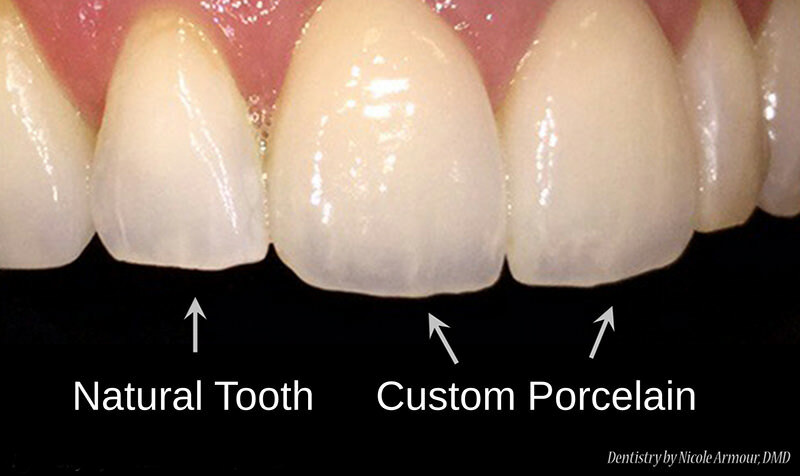 Porcelain can be made to look indistinguishable from natural tooth and so even though our newest composite bonding system can be polished to a high shine and layered with translucency, porcelain will still be superior. Longevity: Porcelain is superior in strength and durability to Composite. No matter how perfectly done, most dental work requires replacement over one’s lifetime. It is subject to the same wear and tear as your own teeth and may be functioning under a less-than-ideal conditions like grinding or dry mouth (xerostomia) which increases cavity risk around dental restorations. Any major cosmetic dental work should be protected with either a nightguard or full coverage retainers. A sports guard is indicated for sports. Nail biting, ice chip chewing and eating rocks are contraindicated. Regular checkups and cleanings and diligent home care prolong the life of your restorations. Time Investment: Porcelain veneers take longer to make than Composite. Porcelain veneers require at least a week to make. During that time, you wear temporary acrylic or composite veneers over your teeth. 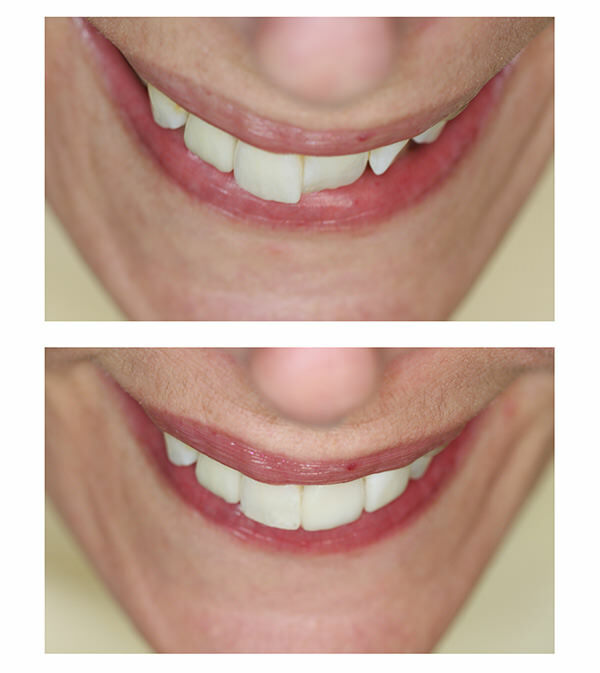 Composite veneers can be made in one visit but require follow-up visits to adjust and polish. 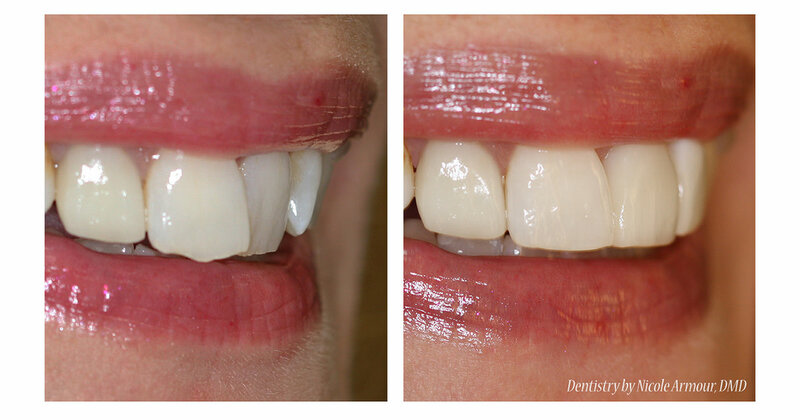 Composite veneers require more touch ups, repairs and polishing in the long-term. Monetary Investment: Porcelain veneers are a greater investment. Because the Composite veneers are created chairside by the dentist during the appointment using materials kept in the office, the cost for this procedure is naturally less. Porcelain veneers involve collaboration with a superior artistic laboratory technician and a delicate laboratory process performed off-site. Porcelain veneers typically last longer than composite and so are a wise long-term investment. Except in special circumstances, insurance rarely assists either procedure. Limitations: There are notable limitations for each material. Porcelain veneers require ideal tooth position so that minimal surface tooth enamel is removed. Porcelain veneers are bonded to enamel and do not bond well to the inner softer dentine layer of your teeth. If teeth are very rotated, crooked, or broken, those teeth may require a full coverage (crown) instead. An individualized treatment plan assessment is required to identify benefits and limitations of each material. Contact our Newtown, PA dental office to set up a cosmetic consultation to learn more about your options. Upcoming blog posts will cover whitening, veneers, crowns, nightguards, implants, trauma, and periodontal disease management at Armour Dentistry of Newtown, PA, in Bucks County.